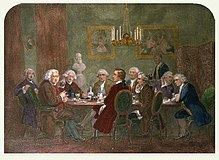 A literary party at Sir Joshua Reynolds's. The person in the blue coat on the right is Oliver Goldsmith - use cursor to identify others. It is not known for sure when he was born. Most people now think that he was born in 10 November 1730. He was the second son of Charles Goldsmith, curate of Kilkenny West in West Meath in Ireland. In 1745 he went to Trinity College Dublin. He quickly spent all his money by gambling, which he became addicted to. After spending some time at the Universities of Edinburgh and Leyden he spent 1755 – 1756 travelling in Europe, where it is said that he lived by playing the flute. Before starting to write he worked in London as a doctor's helper, a doctor, and a school usher. He died in 1774 and was buried in Temple Church. ↑ 1.0 1.1 1.2 1.3 Stobaugh, James P. (2005). British Literature. Nashville, Tennessee: Broadman & Holman Publishers. ISBN 9780805458947. ↑ The Vicar of Wakefield. United States, New York: Oxford University Press Inc. 2006. ISBN 978-0-19-953754-9. Goldsmith Hall - student accommodation and lecture theatre, Trinity College, Dublin. This page was last changed on 28 November 2018, at 20:52.